The Adirondack Chair is a comfortable piece of outdoor furniture created using slats of ordinary one-inch thick milled lumber. It was invented by Thomas Lee around 1903. Lee was searching for a comfortable design for garden furniture. He was unimpressed by the wrought iron or rattan furniture that was available at the time. Wrought iron, while durable, is not very comfortable to sit on. Rattan, in its various forms, is more comfortable but far less durable. A hunting buddy of Lee’s swiped the design and patented it. So for twenty years, the Adirondack chair was marketed as Westport Chairs, and was manufactured by using fir or hemlock wood – both good choices for outdoor items. There’s no record that Lee objected, but it’s generally accepted that Bunnell stole the plans. The Adirondack chair uses three or five knot-free wooden slats for the back, has raked back legs that also serve as the support for the seat – which is formed with more knot-free wooden slats. It seems that this is an important part of the plan because the knot free slats are more comfortable than solid pieces of wood and less expensive. When seated in a properly made Adirondack chair, the curved seat cradles hips and the back of the legs, while positioning the back so that it could rest in a reclining position, with the spine straight – not unlike the reclined position of the gravity chair. Of course, modern materials have brought changes, including Adirondack chairs that are molded from plastic. These molded Adirondack chairs, as well as the more traditional chairs of wood construction, are more than suitable for children, and for older folk as well. The design developed by Thomas Lee and tested out by his twenty family members remains an excellent seat for young and old. Below you can find ten Kids Adirondack Chairs. 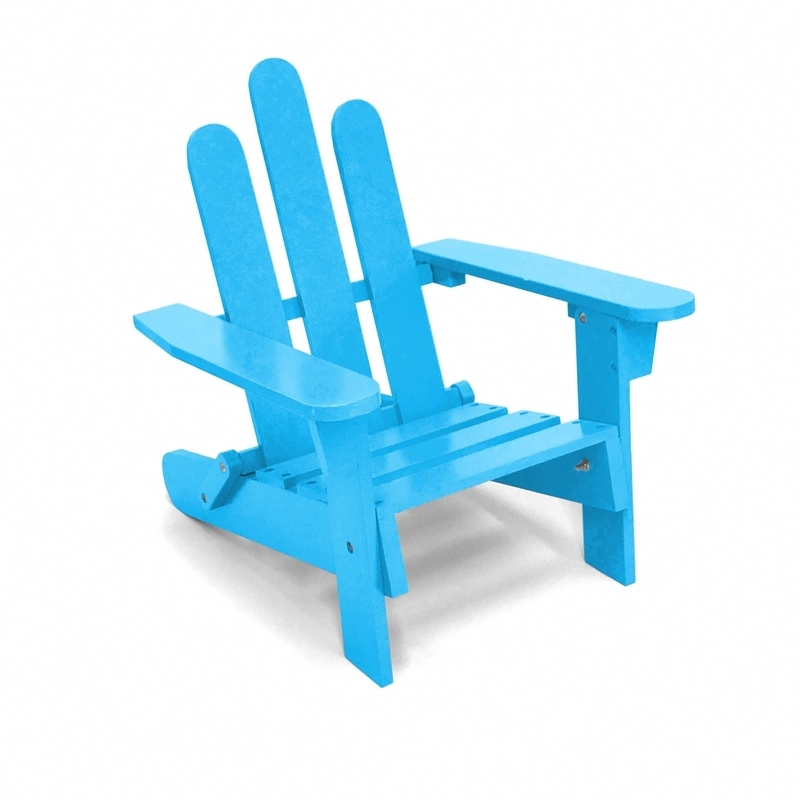 This blue plastic Adirondack Chair is rated for 81 pounds which is perfect for many kids. As it’s made of light resistant materials it’s easy to clean and can be used for outdoor purposes. Being able to reline and relax, this chair works well at pool sides with light concrete or stone surface colors. This slate grey chair has a nice rounded top to act as a headrest on the back of the chair as your kid reclines. The weight capacity is a massive 250 pounds and can hold larger people. The plastic is rated to be able to handle all weather, making it a great outdoor chair for your porch or poolside. Made of wood, this green chair is resistant to the weather and fading. With its color, this chair makes a great garden chair for people to recline when enjoying their garden or to rest in. The rear legs are angled well for a high amount of grip or to dig into a softer ground for a nicer angle. This chair is made of plastic but looks like it’s made of natural wood and is stained with fire engine red legs. Built to hold up to 81 pounds, this chair is great for kids to relax in. Built to be transported easily, this chair is built lightweight and is weather resistant. The mix of colors is great for any kid’s room. Built to hold up to 100 pounds, this chair is made of solid wood with a red cedar color. This chair works well with light stone surroundings and ground. It also works well in a lush green garden area or lawn. Built to be weather resistant, this Adirondack chair is great for outdoor use or indoor. This chair has a light wood tone with its backing made of four baseball bats. This chair is creamy white and works well in lush green lawns with a nature tone. Rated for up to 200 pounds you can have people of all ages to use the chair without fear. If you decide to stain the wood, it will work well on a porch or indoor. This chair has a light wood tone as it’s unfinished, allowing people to add any protective coating that will work for them. The added control makes sure that this chair works well with your décor and blends with the area. The small size is great for kids but can hold a surprising amount of weight. These chairs are a bright orange and can hold up to 50 pounds of weight. The small sizes make these chairs great for kid’s tables and can be easily moved around your home and yard. The supportive back of these chairs encourage posture for your kids and good back support. This chair is built for both indoor and outdoor use as needed. This rocking chair is unfinished and it’s great for kids. The light wood tone will work well with different stains and paints of different colors to work with your home décor. The rocker base has catches on the ends to keep it from tipping over or falling. With a good staining, this chair can work both indoors and outdoors. This Adirondack chair has wide legs to add extra stability and is suitable for uneven ground. Made of a light tone wood, this chair works well with light and bright environments and décor. The chair can be stained with different colors to work with your kid’s room or to fit your outdoor décor. Being lightweight, this chair can be moved around to where you want, indoors or out.